As part of the Volvo Group, UD Trucks has access to a wealth of testing data that it uses to improve automation and connectivity technology to suit the unique needs of each customer. UD Trucks aims to partner with companies across the logistics industry and beyond to build knowledge and refine its technology through a strategy of "building knowledge while testing." UD Trucks Senior Vice President of Technology, Douglas Nakano, spoke at the demonstration. "UD Trucks is proud to present the first demo of Level 4 automation for heavy-duty trucks. Today's demo is a major step toward practical application of this technology by 2020. Our heavy-duty truck Quon, launched in 2017, contains a sophisticated vehicle control system, which is the base of our highly-precise automation technology. Based on the Quon, UD Trucks will continue to develop more advanced automation technology to address the needs of our customers everywhere and provide the trucks the world needs today. In doing so, we want to drive open discussion together with our business partners. We hope this public demonstration will be the opportunity to start that discussion." UD Trucks' automation technology "Fujin"-named for the Japanese god of wind-is one of the two pillars of the UD Trucks' Innovation Roadmap Fujin & Raijin. Vision 2030, announced in April 2018. The Innovation Roadmap lays out solutions for global issues facing the logistics industry, such as the need to reduce CO2 emissions, the growing scale of e-commerce, and driver shortages. As part of the Volvo Group, UD Trucks can leverage a wealth of knowledge from different use cases around the world. Assets are collected from around 800,000 connected vehicles to improve automation and connectivity technology and make logistics smarter. UD Trucks Senior Vice President of Process & Solutions, Satish Rajkumar, spoke about the benefits of UD Trucks' position within the Volvo Group. "We have access to Volvo Group assets, so we will leverage this to improve customer experience, contribute to smart logistics and the development of society." 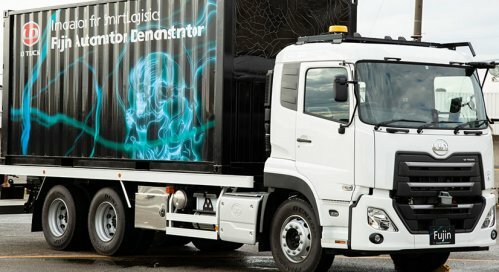 UD Trucks will continue demonstrations of autonomous driving and electric drive prototypes, aiming to complete field tests and customer trials ahead of Tokyo Motor Show 2019-with a view toward daily operation by 2020 and commercialization of fully-electric trucks and autonomous trucks by 2030.